You’ll use the Graphcool CLI to build (and deploy) your GraphQL API based on the data model that you need for the app. As you can see from the comments, some fields on your model types are read-only. This means they will be managed for you by the Graphcool Framework. Every type annotated with the @model-directive will be mapped to the database and corresponding CRUD-operations are added to the GraphQL API of your Graphcool service. The @isUnique-directive means that the annotated field can never have the same value for two different records of that type (also called nodes). Since this is a read-only field, the Graphcool Framework will take care of managing this constraint. createdAt and updatedAt are special fields that are managed by the Graphcool Framework as well. createdAt will carry the date for when a node of that type was created, updatedAt when it was last updated. For starting out, you’re not going to use the full data model that you saw above. 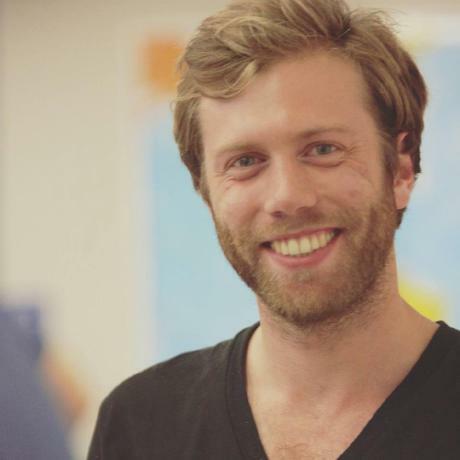 That’s because we want to evolve the schema when it becomes necessary for the features that we implement. For now, you’ll just use the Link type to create the backend. The first thing you need to do to get your GraphQL server, install the Graphcool CLI with npm. To use the Graphcool CLI, you can either use the graphcool-framework command, or the shorter form: gcf. Creating the local file structure that contains all required configuration for your backend. This is done with the graphcool-framework init command. Configuring the data model and deploying the server with graphcool-framework deploy. graphcool.yml: This is the root configuration file for your Graphcool service. It tells the Graphcool Framework where to find your data model (and other type definitions), specifies the permission rules and provides information about any integrated serverless functions. types.graphql: This specifies the data model for your application, all type definitions are written in GraphQL SDL. package.json: If you’re integrating any serverless functions that are using dependencies from npm, you need to list those dependencies here. Note that this file is completely independent from the dependencies of your frontend which you’ll create in a bit. Since this tutorial won’t actually use any serverless functions, you can simply ignore it. src: The src directory is used to for the code of the serverless functions you’re integrating in your Graphcool service. It currently contains the setup for a simple “Hello World”-resolver function (which you can delete if you like). Again, you can ignore this directory since we’re not going to use any functions in this tutorial. Next you need to make sure that the data model of the GraphQL server is correct, so you need to adjust the type definitions in types.graphql. As mentioned above, we’ll start with only a sub-part of the actual data model and evolve our schema and API when necessary. This change is all you need to put your GraphQL server into production. Note that this command will open up a browser window first and ask you to authenticate on the Graphcool platform (if you haven’t done so before). 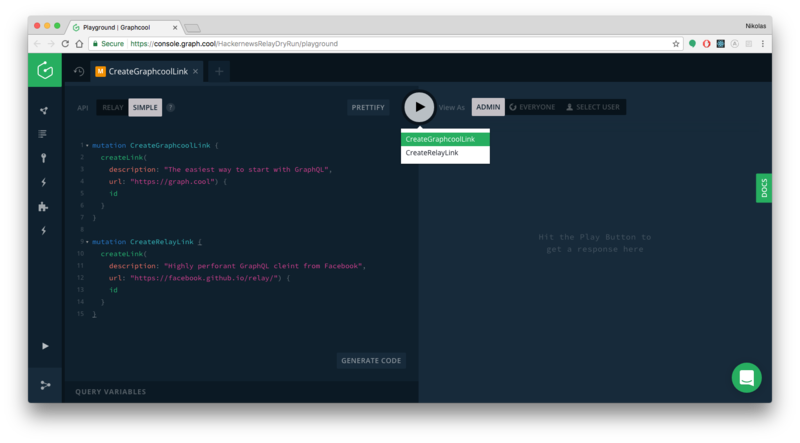 You’ll do this by using a GraphQL Playground which is an interactive environment that allows you to send queries and mutations. It’s a great way to explore the capabilities of a GraphQL API. The left pane of the Playground is the editor that you can use to write your queries and mutations (and even realtime subscriptions). Once you click the play button in the middle, the response to the request will be displayed in the results pane on the right. 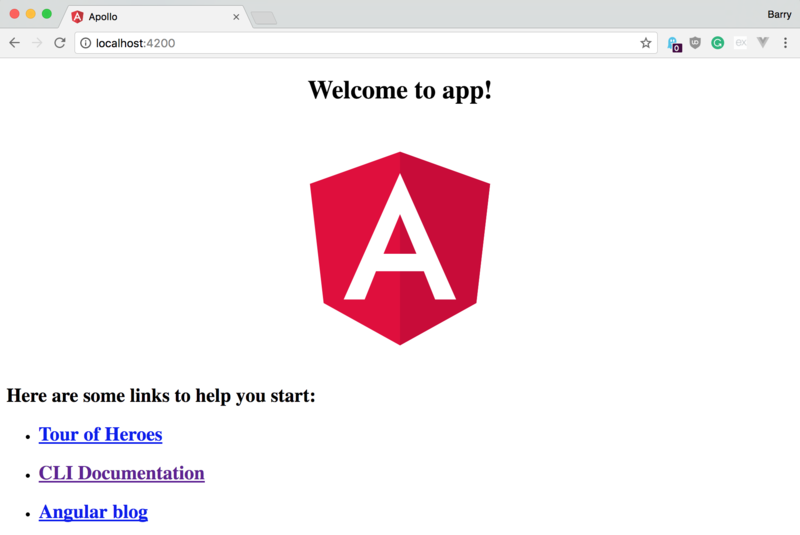 Next, you are going to create the Angular project! As mentioned in the beginning, you’ll use angular-cli for that. This will create a new directory called hackernews-angular-apollo that has all the basic configuration setup. This tutorial is about the concepts of GraphQL and how you can use it from within an Angular application, so we want to spend the least time on styling issues. To ease up usage of CSS in this project, you’ll use the Tachyons library which provides some CSS classes. Since we still want to have a bit more custom styling here and there, we also prepared some styles for you that you need to include in the project. apollo-angular contains the bindings to use Apollo Client with Angular. graphql-tag is a GraphQL parser. Every GraphQL operation you hand over to Apollo Client will have to be parsed by the gql function. apollo-angular-link-http provides a similar HttpLink to Apollo’s HttpLink with one difference, it uses Angular’s HttpClient. apollo-cache-inmemory is a cache implementation that supports all of Apollo Client 1.0’s features without the dependency on Redux. graphql contains Facebook’s reference implementation of GraphQL - Apollo Client uses some of its functionality as well. Apollo abstracts away all lower-lever networking logic and provides a friendly interface to the GraphQL API. In contrast to working with REST APIs, you don’t have to deal with constructing your HTTP requests anymore - instead, you can just write queries and mutations and send them using the ApolloClient. The first thing you have to do when using Apollo is to configure your ApolloClient instance. It needs to know the endpoint of your GraphQL API so it can deal with the network connections. Finally, we export the GraphQLModule. Next, you need to replace the placeholder for the GraphQL endpoint with your actual endpoint. But where do you get your endpoint from?